Mold Shield, Rust Preventative and Inhibitor, No-Rust®, Rust Preventative and Inhibitor, Acid Vapor Neutralizer, Rust Preventative and Inhibitor, Econo-Spray, Rust Preventive and Inhibitor, Penetrant Plus, Rust Preventative and Inhibitor & Quick Rust Preventive. Slide Antioxidants There are 7 products. 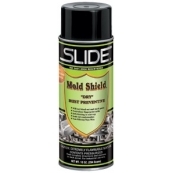 Slide 42910 Mold Shield is a unique formula which delivers an ultra-dry, non-penetrating mist into moving mold parts, including ejector pin holes, slides, and cams. Mold Shield protects up to two years under normal indoor storage conditions without marking of plastic parts when molds are put back in service. 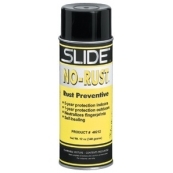 Slide 40212 No-Rust is a positive one-step rust preventive that contains both neutralizer and rust inhibitor. It protects up to five years under normal indoor storage conditions by displacing moisture from metal surfaces and adhering tightly. Ideal for mold and die protection, stripper plates, jigs and fixtures, precision instruments, machine tools and machined or ground steel of all kinds. 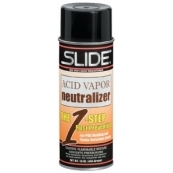 Slide 44011 Acid Vapor Neutralizer is formulated to protect molding dies from corrosive attack by hydrochloric and hydrobromic acids. It neutralizes acid vapors when molding pvc and flame-retardant resins. This rust preventive also provides protection from most common corrossive damage that is found in the atmosphere. Slide 45510 economical rust preventive quickly and effectivley displaces moisture and with a harmless blue tracing color helps show coverage. So you can spray damp metal without drying before applying. It helps rust removal and is compatible with lubricating oil and greases. Slide 42810R Quick Rust Preventive features a combination of fast evaporating solvents and oils to set up quickly on your mold surfaces, employing a harmless red dye for indicating covered area. Provides immediate protection against moisture and light acids. This unique "dry" formula with self-cleaning in start-up makes clean-up quick and easy when the mold is put back into production. Slide 41812 Multi-Purpose Mono-Molecular Penetrating Oil Frees Rust-Frozen Parts. Lifts & replaces moisture with a protective film. It's dielectric non-conductive properties are ideal for lubricating electrical equipment including delicate electronic devices without affecting their intended performance. Penetrant Plus is harmless to most plastics, rubber, & paints. Slide 46710 White Rhino Rust Preventive wraps your mold in a tough, protective second skin. comprised of food approved active ingredients, it’s ideal for plastics processing applications. Fast-Drying formulation sets up quickly to protect immediately against moisture and light acids. self-cleaning in startup. Available in aerosol cans as well as liquid containers.